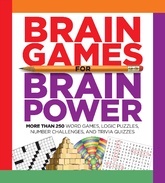 Featuring a delightful mix of classic and new puzzle types, this stimulating book is designed to help improve a variety of brain skills, including your ability to remember. And, unlike most things that are good for you, this health routine is 100% fun. When you dive into these crosswords, trivia quizzes, word searches, brainteasers, puzzles, Sudoku games, and more, the real goal is for you to enjoy the challenges. But behind the scenes, you’ll be encouraging your brain to sharpen its concentration, increase its spatial perception, and flex its memory functions. With more than 250 fun puzzles at varying levels of difficulty, you’ll get plenty of intellectual exercise and you’ll never break a sweat!